Are you ready for the most romantic game of solitaire that you've ever played! The perfect game for the introvert who loves romance and cards, but does not want all the drama of a real relationship. In all seriousness, though, this really is a fun and challenging game with beautiful and charming art and scenery. It's much more than your standard desktop solitaire card games; L'Amour is definitely worth the buy. The card designs are interchangeable, so if you get tired of one deck, you can easily choose another to keep the game wild. The mystical world of Jewel Match has much to offer. 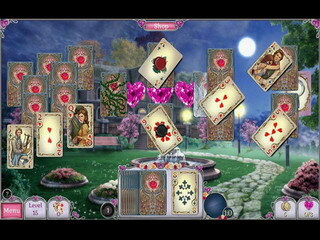 This solitaire game is absolutely charming and has plenty of games to keep you busy for hours on end. There are beautiful graphics for you that you simply won't find elsewhere. For about the cost of a good deck of cards (which, will eventually wear out), you will be able to play this card game over and over and over again... and there are even FIFTY mahjong levels which are replayable time and time again. Talk about bang for your buck! The card designs are interchangeable, so if you get tired of one deck, you can easily choose another to keep the game wild - the art in the Jewel Match franchise is top-notch in its field and it shows in the Solitaire L'Amour episode. Also of special interest are the additional rules that you can add to the classic Solitaire, for example, there are obstacles, frozen cards, power-ups, and all sorts of other goodies. This really is a cool game. There are two hundred , yes TWO HUNDRED solitaire levels for you to enjoy. As mentioned earlier there are another fifty mahjong levels to conquer as well. 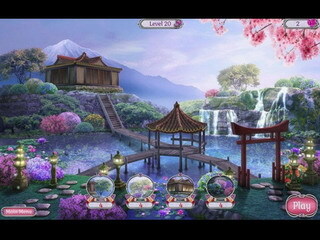 You also get to construct these five really beautiful romantic scenes throughout the gameplay as well. If you like the beautiful style of fairy tale romance, then put down the desktop version as this really is the solitaire game for you. Awesome art and music! This is a new twist on some old games that will blow your hat off. Get in on it today! This is Jewel Match Solitaire: L'Amour review. Download this game here.